BRIGHTON, Mich. - Ford Motor Company volunteers and employees give back to the environment for Ford Accelerated Action Day. Last Friday, June 5th, hundreds of Ford Volunteer Corps members across the county participated in community environmental projects as part if Ford Motor Company Accelerated Action Day aimed at building healthier and stronger communities on World Environment Day. and the Ford Motor Company Fund also provided more than $47,000 in grants to purchase tools and supplies for the volunteer projects going on. Jim Vella, president of Ford Motor Company Fund and Community Services, stated that, "Ford and its employees are always looking forward, creating and innovating to improve the vehicles we build and the communities where we live and work." Many non-profits participated with Ford Motor Company for this exciting day including Arbor Hospice of Ann Arbor, The Boy Scouts of Metamora, Fish & Loaves of Taylor, Gleaners Community Food Bank of Farmington Hills, Forgotten Harvest of Oak Park and many more! Ford employees and participants also teamed up with Ford Green IT to collect unused computers, printers and other types of electronic equipment that need to be recycled. Last year, Ford Green IT collected more than 75,000 pounds of e-waste, which was recycled and kept OUT of landfills. Ford Motor Company volunteers and employees give back to their environment for Ford Accelerated Action Day and hope to collect a similar amount of e-waste this year! 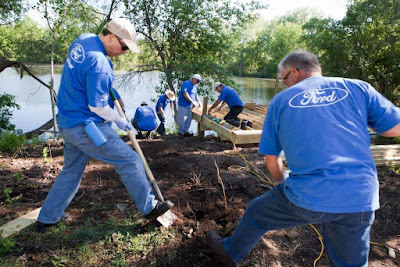 "From river fronts to neighborhood streets, the scope of these projects shows how far Ford volunteers go to improve their local environment." said Janet Lawson, director of Ford Volunteer Corps. Here at Brighton Ford, we are so proud of representing a company that cares so much for the environment! To learn more about our environmentally friendly Ford vehicles here, check out our online inventory or give us a call! Brighton Ford is located at 8240 Grand River Ave. just north of I-96 in Brighton. We are a family owned and operated business that strives for customer satisfaction. For more information on Brighton Ford visit BrightonFord.com or give us a call at (800) 836-8206.